Jackson State: A Tragedy Widely Forgotten Just 10 days after the deaths at Kent State, shots rang out at a predominantly black college in the South. Two youths were killed and a dozen wounded in the shooting by police at Jackson State in Mississippi. 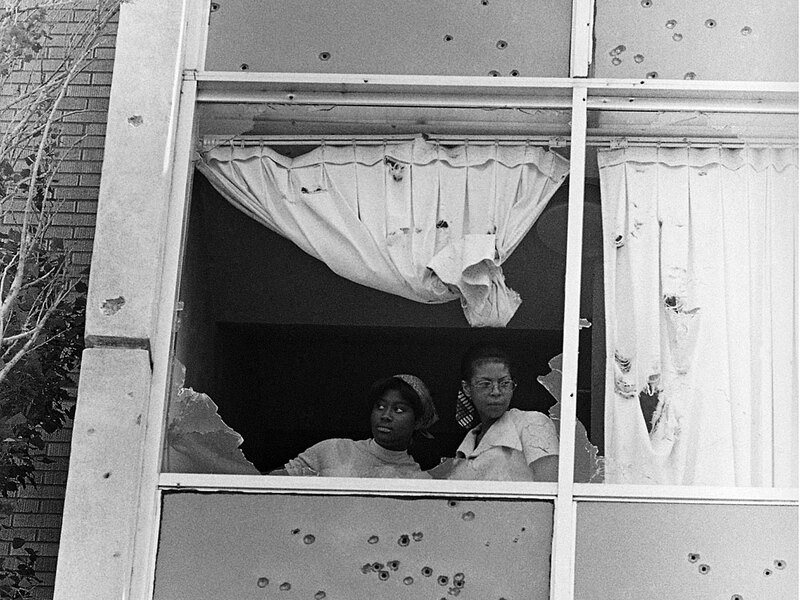 Two students at Jackson State peer from a window that was shot out by police on campus in May 1970. A group of angry students. A burst of gunfire from authorities. Young lives cut short. The tragedy was the culmination of increasing friction among students, local youths and law enforcement. On the evening of May 14, African-American youths were reportedly pelting rocks at white motorists driving down the main road through campus -- frequently the site of confrontations between white and black Jackson residents. Tensions rose higher when a rumor spread around campus that Charles Evers -- a local politician, civil rights leader and the brother of slain activist Medgar Evers -- and his wife had been killed, according to Lynch Street: The May 1970 Slayings at Jackson State College. The situation escalated when a non-Jackson State student set a dump truck on fire. Police responded to the call. A group of students and non-students threw rocks and bricks at the officers. Police advanced to Alexander Hall, a large dorm for women. According to a 1970 report from the President's Commission on Campus Unrest, police fired more than 150 rounds. And an FBI investigation revealed that about 400 bullets or pieces of buckshot had been fired into Alexander Hall. The shooters claimed that there was a sniper in the dorm, but investigators found "insufficient evidence" of that claim. The event continues to leave a mark on the university. 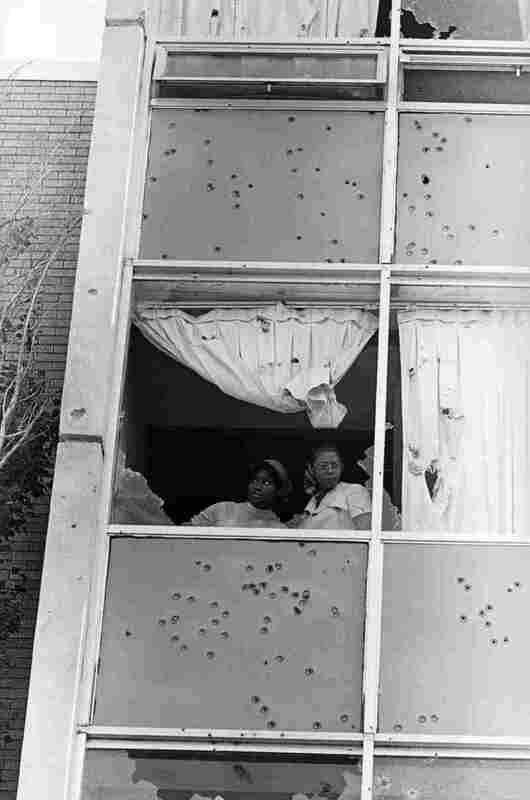 Even today, passers-by can see the bullet holes in the women's dorm. A plaza on campus commemorates the victims of the shooting. All Jackson State students learn about the shooting in a mandatory orientation class, and professors evoke the event as a teaching tool. C. Liegh McInnis, who teaches creative writing and world literature at Jackson State, says the story of the shooting is integrated into the curriculum of several liberal arts departments. In McInnis' own freshman composition class, students are required to see the bullet holes in the women's dorm themselves while researching a critical analysis paper about the shooting. On Thursday, Jackson State held a 40th anniversary memorial to pay tribute to the victims of the shooting. The event brought back 24 alumni who attended Jackson State in 1970, some of whom had been injured that night. "The tragedy showed the resolve of the students," McInnis said. McInnis said all of the alumni -- who had traveled from places like Houston and Detroit -- ended up being leaders in their fields and their communities. "What the shooting did is that it showed, even through this heinous act, black intellect could not be stopped," McInnis said.